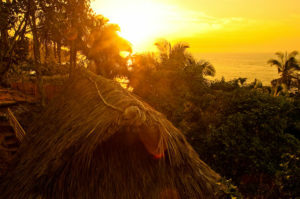 Xinalani is an exclusive Eco-Chic Yoga Retreat Center in Puerto Vallarta, Mexico, combining world-class yoga studios with beautiful, eco-chic accommodation; delicious, healthy & authentically Mexican food; relaxing & rejuvenating spa treatments; fun adventures + activities; and an extraordinary staff who takes pride in delivering an unforgettable stay for even the most discerning of guests. As the days goes and your practice deepens, feel into where you are ready for new beginnings. Fill your journal with your dreams, ideas and hopes, and get really clear on what you want to keep in your life and what you want to let go of. Know that you can change everything or nothing at this time, and that literally anything is possible. Get ready to ignite your own inner magic. 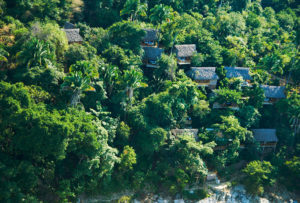 All the accommodations are beachfront, spacious, palm-thatched cabins built on stilts. You will enjoy the closeness of the natural elements and the stunning views of the Pacific Ocean from your terrace. In every room you will find a private open-air bathroom with a big closet and a safe deposit box. 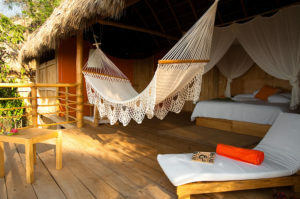 The suites are the most spacious lodges, they have a hammock, a private terrace, and a sitting area. To guarantee a great relaxing retreat, all beds in Xinalani have upscale pillow top mattresses, luxury linen, and gorgeous silky white mosquito netting. Only 10 spots available so be sure to claim your spot! 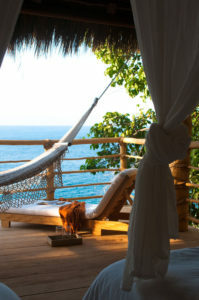 Xinalani Retreat is set among 10 acres of splendid unspoiled jungle on the southern shore of Banderas Bay. Only 12 miles south of Puerto Vallarta International Airport (PVR), Xinalani’s 250 yard wide pristine sand beach can be accessed solely by boat. There are no roads leading to the property. For boat transportation purposes, guests should book an arrival flight that lands no later than 4:30 PM and a departure flight that takes off no earlier than 11:00 AM. Transfer by taxi or van from the airport to the pier at Marina Vallarta or Boca de Tomatlan. Transfer by boat from the pier to Xinalani. Return to the airport at the end of the retreat. Any guests not returning to the airport must pay for their own transportation from the Marina or may go to the airport and choose the transportation of their choice to go to their final destination. Transfer to/from the airport is included in your retreat package. Start off your day each morning at 7:00 am with tea, coffee, fruit, and home made granola. 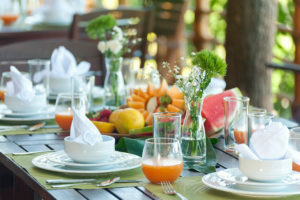 After your morning practice you will be treated a complete and nutritious breakfast served buffet style from 9:30 to 10:30 am. Lunch is served from 1:30 to 2:30 pm, and dinner from 7:30 to 8:30 pm. All meals include gluten-free and vegan options. Morning snack + three locally grown gourmet meals a day and complimentary water, coffee & tea throughout your day is included in your retreat package. 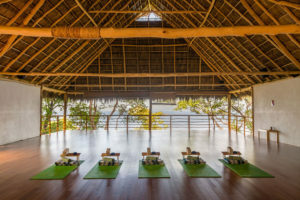 Join me on my Leela Yoga Summer Solstice Retreat and plant the seed of a newly found well-being.